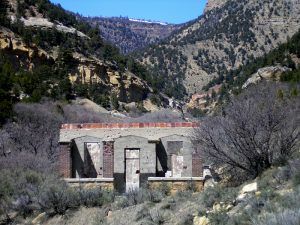 Getting its start in 1912, the mine and settlement were developed by the Standard Coal Company at the mouth of Gilson Gulch in Spring Canyon. 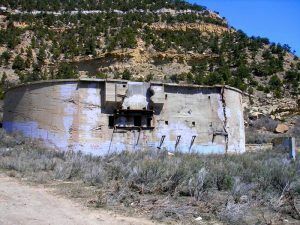 The mine was located just about ¼ mile north of the new town. 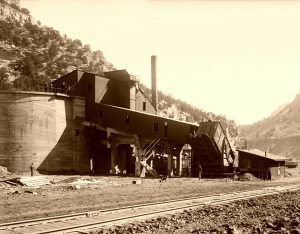 The Standard Coal Company apparently had extensive financial resources, because most of the construction at both the town and the mine occurred within the first year. In 1913, The Denver & Rio Grande Railroad extended its line from Storrs westward to Standardville. 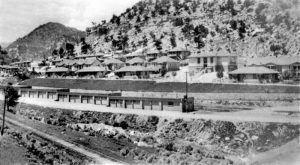 Improvements and additional facilities were added throughout the 1910s and by 1914, the town, tipple and mine facilities were completed. The town of Standardville was a model company town that was so well planned, it was intended to be the “standard” for other mining camps to follow. In February 1914 the company shipped its first coal and during that year the mine was producing about 200 tons of coal daily. A year later the output had increased five fold. By 1915, the Standard Mines employed a 143-man workforce and, in that year, produced 149,453 tons of coal. 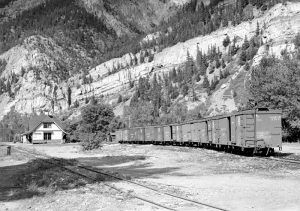 Both the Utah Railway Company and the Denver & Rio Grande Railroads transported the coal to the market and early on a stage line ran daily between Standardville and Helper. In the next few years, the population of Standardville increased and the town boasted a large company store, steam-heated apartments, a butcher shop, a barber shop, a hospital, recreation hall, tennis courts, and an elementary school with four teachers and 200 students. Junior high students attended school in Latuda and high school students traveled to Price. But, all was not perfect in the “model” town as it had a long history of mining strikes, which sometimes erupted into violence. In June 1922, a mine guard was killed, and the mine superintendent and a miner wounded, by strikers who were attempting to stop a train bringing in strikebreakers. When the Utah governor learned of the shooting, he sent National Guard troops to the area and issued a proclamation of martial law in the Carbon County Coal District. The company maintained a workforce of 350 men through the mid-1920s. In 1927, the Standard Coal Company boasted that Standardville had a complete waterworks system, electric lights, steam heat, mercantile stores, a meat market, an ice factory and refrigerating plant, a confectionary store, soda fountain, moving picture theatre, playgrounds, and a school. The company pamphlet showed photographs of the main street lined with one, one and one-half, and two-story frame homes set on concrete foundations with gable and hipped roofs and clapboard siding. Many of the commercial and public buildings were constructed with tile and covered with stucco. Although supervisory personnel tended to live in larger, more substantial residences, there was very little hierarchy in the housing along either ethnic or economic lines. Management and labor lived side by side in this community. The Standardville mines were considered safe, but on February 6, 1930, disaster struck Standardville when a gas explosion erupted in the mine. While 29 men were working, a pocket of carbon monoxide gas was ignited probably from sparks from a cutting machine. In the initial explosion, three men were killed and another 17 men died by the spreading of carbon monoxide gas. Three rescue workers were killed when they were crushed during a cave-in. The rest of the miners survived by barricading themselves from the gas with canvas and were later rescued. Though the explosion dealt a blow to the mine and the community, it continued to thrive and by 1932, more than 2,000 tons daily went over the modern steel tipple. Though the mine was still producing heavily, it was struggling financially in 1939 and was unable to meet its payroll in January. To keep the mine from closing, the 265 miners voted unanimously to work only for food to save the mine from closing. However, the mine was closed on April 5, 1939. The company was then sold under foreclosure on November 3, 1939, and reorganized as Standard Coal, Incorporated. Shipments resumed on December 1, 1939. World War II provided new markets for coal, and production once again soared, only to decline sharply after the war. At the same time, the nation’s railroads began converting to diesel engines, and home heating shifted bo natural gas and oil. However, in 1948 the Spring Canyon Coal Company was still operating the Standard Mine, along with the Spring Canyon Mine, and the Royal Mine. But, two years later, in 1950, the Standard Coal Company mine was closed, followed by the stores, the school, and the hospital as miners moved away. 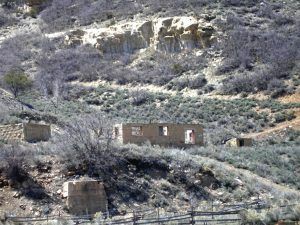 However, the mine office remained open and two families continued to live in the town until the early 1970s. Until that time, most of the buildings at Standardville remained standing and in good condition. Finally, the buildings were sold to the public at a nominal fee and many wood frame buildings were moved to the communities of Helper and Price. Many of the stone and tile buildings were torn down, but others continued to stand but the roofs and interiors were gutted for lumber. The mine portals were dynamited or caved in. Today, the site of Standardville is marked by the circular concrete coal tipple at the mouth of Gilson Gulch, the roofless tile bath house farther up the gulch, and a few other scattered remnants. At its peak, Standardville supported almost 600 residents.